On arrival, you will be greeted by your driver at Keflavík Airport and taken to your hotel in Reykjavík, where you will find a welcome gift of champagne and chocolate from Iceland´s finest confectioner. If you're interested in checking out Icelandic design or experiencing the city's thriving coffee culture, head to the main street, Laugavegur, to enjoy its various shops and cosy cafes. And in the evening there are numerous fine restaurants in the downtown area where you can enjoy a gourmet dinner. Spend the night in Reykjavik. After collecting your rental car, your journey begins! 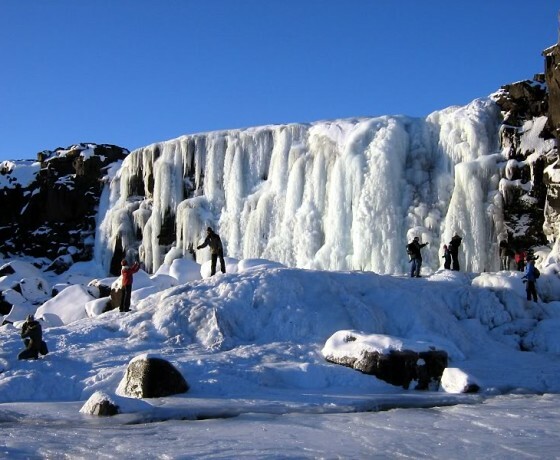 Today you will explore some of the best-known highlights in Iceland on the so-called “Golden Circle” route, including the beautiful and geologically unique Þingvellir National Park. Here at this UNESCO World Heritage Site, you will have the opportunity to walk in the continental rift valley near the nation’s ancient Parliament grounds and visit the deep gorges near the lake, including the Silfra crack that is popular with divers. 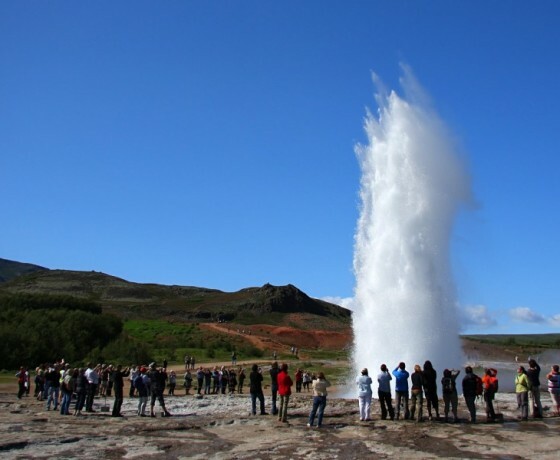 Then head to the great Geysir area with its spouting hot springs and Gullfoss, “The Golden Waterfall” before continuing to your overnight accommodation. Spend the night in Selfoss/Hvolsvöllur area. Driving distance approx. 250 km / 155 mi. 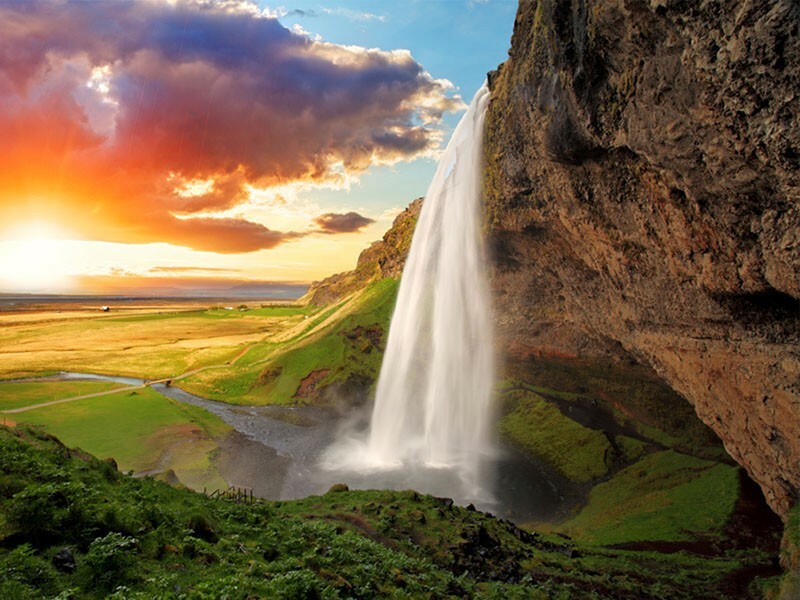 Start the day with a visit to the beautiful Seljalandsfoss waterfall, where you can walk right behind the misty cascade, and then head to the equally gorgeous Skógafoss waterfall just a short drive down the road. Further along near the village of Vík, we also recommend a stop at the volcanic black sand beach for dramatic views of the Dyrhólaey and Reynisdrangar rock formations rising above the crashing waves. The last stop of the day is to the deep and narrow Fjaðrárgljúfur canyon. Time permitting, you may also join a guided excursion by foot or snowmobile on a glacier today! Spend the night in the Kirkjubæjarklaustur/Skaftafell area. Driving distance approx. 220 km / 137 mi. 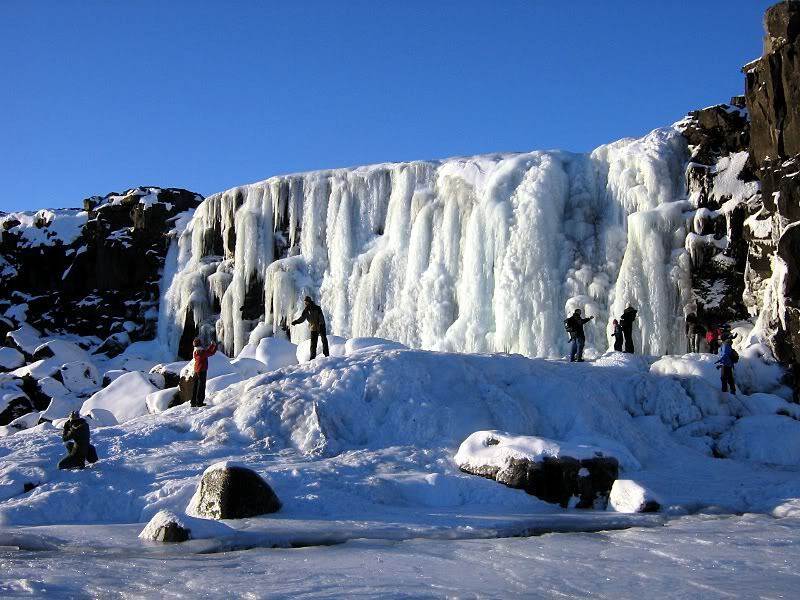 Spend some time enjoying the natural beauty of the Skaftafell area in Vatnajökull National Park. 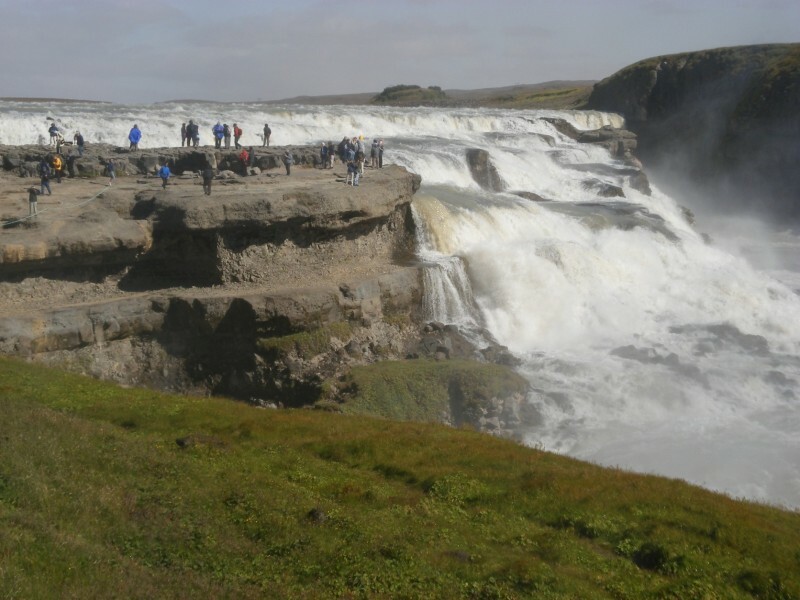 Here you have the option of taking a scenic hike on a variety of interesting trails, including one that leads to the Svartifoss (“Black Falls”) waterfall, which tumbles over a wide cliff of dark basalt columns that resemble organ pipes. Then in the afternoon, head east to the Jökulsárlón glacier lagoon, one of Iceland’s most iconic attractions and popular postcard image. Here you will enjoy a short boat tour among the large floating icebergs—a truly unforgettable experience to end the day. Spend the night in the Höfn or Djúpivogur area. Driving distance approx. 210 km / 130 mi. Enjoy the spectacular fjord scenery, natural tranquillity and charming fishing villages as your journey takes you through the East Fjords region. Notable sights on the way include the majestic Mt. Búlandstindur, the village of Seyðisfjörður and the Lagarfljót River, said to be inhabited by a monster worm. Upon reaching today’s destination—the moon-like Lake Mývatn area in North Iceland, you can explore highlights such as the Krafla volcano, the curiously-coloured Námaskarð pass, the massive crater of Hverfell, the pseudo-craters at Skútustaðir and the legendary lava maze of Dimmuborgir. Spend the night in Lake Mývatn/Akureyri area. Driving distance approx. 415 km / 258 mi. Use this day to further explore your surroundings in the Lake Mývatn area. Our suggestion is to start the day with an optional whale-watching trip from bay in the village of Húsavík, locally known as “The Whale Watching Capital of Europe”. 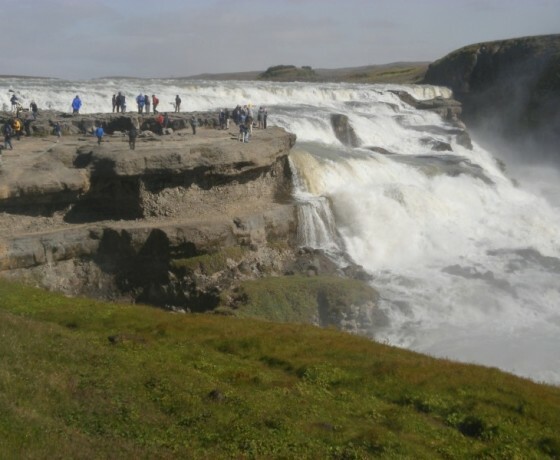 From there, drive through Jökulsárgljúfur—part of Vatnajökull National Park—where you can take your time visiting sights like the hoof-shaped Ásbyrgi canyon and Dettifoss, the most powerful waterfall in Europe. End the day back in the Mývatn area with a relaxing soak in the warm geothermal waters of the Mývatn Nature Baths, a great place to enjoy the soft glow of the midnight sun. Spend another night in the Lake Mývatn area. Driving distance approx. 200 km / 124 mi. 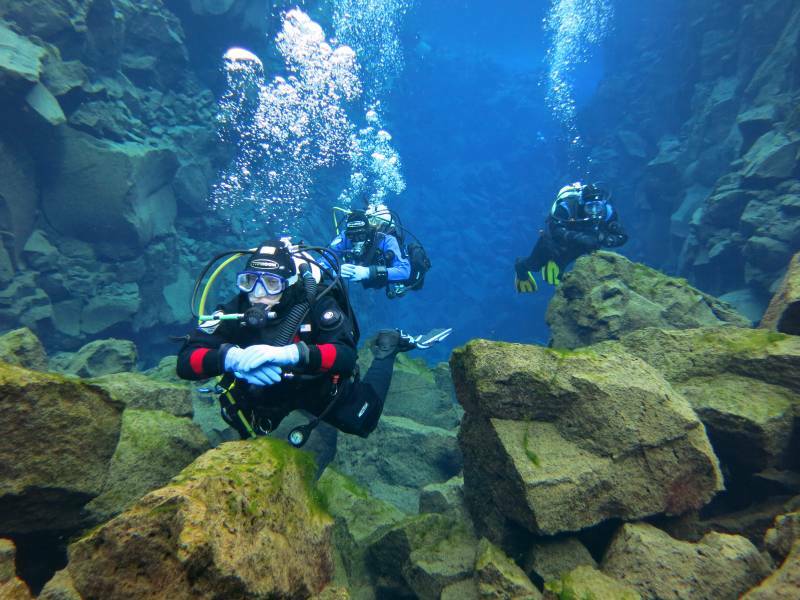 Spend a leisurely morning in the Mývatn area. Once you begin your drive west to your next destination, we recommend a visit to Goðafoss (“The Waterfall of the Gods”) and a break to walk around the charming town centre of Akureyri, where you will find interesting shops and museums as well as the world's most northerly botanical garden. From Akureyri, you have the choice of either heading straight to Skagafjörður or taking a detour on the way there to Tröllaskagi (“The Peninsula of the Trolls”), where you can enjoy fantastic scenery of beautiful mountains, cliffs and fjords. Then, continue through Siglufjörður, which was once the centre of Iceland’s herring fleet, and make a stop at Hofsós to relax in the thermal pool (optional) before arriving to Skagafjörður, an area known for its abundance of purebred Icelandic horses. Spend the night in Northwest Iceland. Driving distance approx. 250 km / 155 mi. Head to Snæfellsnes Peninsula today. On the way, you’ll see the countless mounds of Vatnsdalshólar and the beautiful Þingeyrarkirkja church. You may also wish to visit the living museum at Eiríksstaðir, home of famous Viking Erik the Red, and the hot geothermal pool of Guðrúnarlaug. We also recommend spending some time in Stykkishólmur, a picture-perfect fishing village overlooking Breiðafjörður Bay. Here, you can take a walk up to the small hill, Súgandisey, which overlooks the harbour and offers wonderful panoramic views over the town, sea and surrounding mountains. Spend the night on Snæfellsnes Peninsula. Driving distance approx. 260 km / 162 mi. 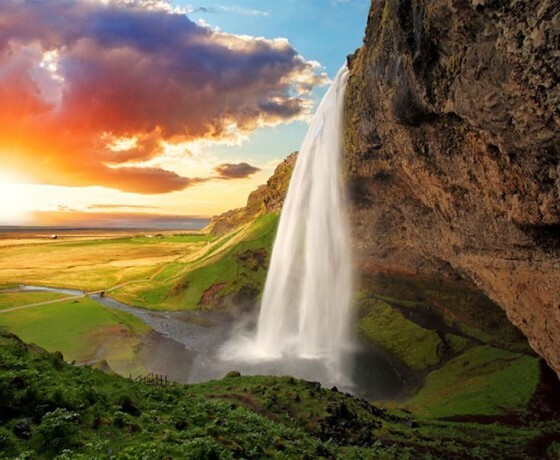 Experience the unique sights of Snæfellsjökull National Park and the glacier-topped volcano it’s named for. As you drive along the coastline of this mountainous peninsula, you can visit charming seaside hamlets, the beautiful Dritvík Cove and the bird cliffs of Lóndrangar, Hellnar and Arnarstapi. You can also test your strength with the “lifting stones” on the Djúpalónssandur beach like the sailors or yore or choose from a variety of optional activities like horse riding, hiking or sailing tours. End the day back in Reykjavik, where you will return the car and spend the night. Driving distance approx. 290 km / 180 mi. Before heading to the airport, you will get to experience Iceland’s famous Blue Lagoon, a geothermal spa renowned for its mineral-rich waters surrounded by a moon-like lava field. It was voted as the best medical/thermal spa in 2009 by the readers of “Conde Nast Traveller”. Here you will enjoy about 2.5 hours in the Exclusive Lounge with complimentary towels, bathrobe, slippers and light refreshments as well as a deep, relaxing half-hour massage in the warm water of the lagoon. After this wonderful last memory of Iceland, the driver will take you to the airport. Note: If your flight is in the morning, we can change your travel itinerary accordingly. We are also happy to customize your holiday with additional day tours or extra nights in Reykjavik or other locations not listed in the itinerary. Please contact us for details. Optional activities - can be added on request. Any services not listed above in “Included"
Can’t tell you how much we enjoyed the trip. The guides, Adil could not be beat. They worked so hard to make sure we were comfortable and taken care of well. Their knowledge expanded our grasp of the land, the people and our history. We were so fortunate to team up with a great group of people. This trip went beyond our expectations and we wouldn’t hesitate to recommend it to anyone or to use Mech Journeys again. Can’t tell you how much we enjoyed the trip. The guides, Adil could not be beat. They worked so hard to make sure we were comfortable and taken care of well. We still thinking of how marvelous our trip in India/Rajasthan and with the whole group in Delhi and Aurangabad was and how well organized by you. Could you please elaborate some trip proposals including driver I assume? We had planned a special holiday and MecH Journeys certainly did their best to make it special and memorable for us. The planning was meticulous and all went to plan. 23 days touring Rajasthan and Himachal Pradesh. The representatives were professional and guides adjusted the program to suit our requirements with no fuss. Thank you, and I have already started to recommend your service to all that have shown an interest. We had planned a special holiday and MecH Journeys certainly did their best to make it special and memorable for us. The planning was meticulous and all went to plan. 23 days touring Rajasthan and Himachal Pradesh.